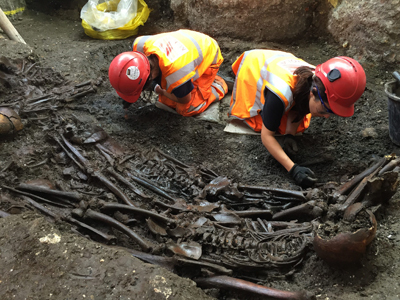 Thirty skeletons found in a mass burial – the latest archaeological find at Crossrail’s Liverpool Street site – are believed to have been victims of the Great Plague of 1665. Made during the excavation of the former Bedlam burial ground in order to make way for a new eastern entrance to the station, the discovery comes during the 350th anniversary year of the Great Plague. Jay Carver, the lead archaeologist for Crossrail, said the mass burial – with the bodies placed in now long gone wooden coffins – was unlike other individual burials found in the cemetery and thus “is likely a reaction to a catastrophic event”. “Only closer analysis will tell if this is a plague pit from the Great Plague of 1665 but we hope this gruesome but exciting find will tell us more about one of London’s notorious killers.” Clues which suggest that may be the case include a headstone found nearby marked “1665” and the fact that the 30 people all seem to have been buried on the same day. Museum of London Archaeology osteologists will now analyse the skeletons to find out the cause of death. Archaeologists have excavated more than 3,500 skeletons from the site since excavation of the burial ground – used between 1569 to at least 1738 – began earlier this year. It suggested 30,000 Londoners were buried there during that period. For more on the the Great Plague, see our earlier post here. PICTURE: © Crossrail Ltd.